This kit by Jeff at mightyohm.com offers a variety of easy to use interfaces for passing counter data out to a microcontroller or computer for further logging or reporting. 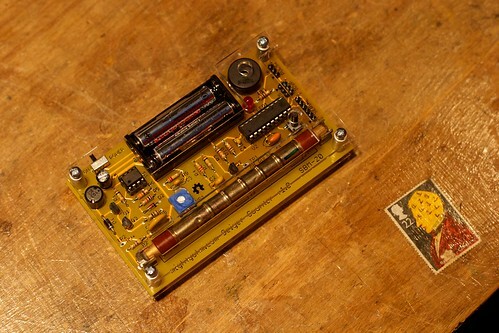 Ideally, this sensor could live at Resistor and provide local alerts for unhealthy levels of radiation and feed data into an established (I presume it exists,) citizen sensor network for monitoring radiation over a wider area. I haven’t studied the details enough to establish feasibility of the latter or whether the sensor would provide the right kind of data for such a network, but when this project’s time slice arrives on my scheduler, I’ll research those details.